The Bulldog has been around for over 500 years, but it’s changed a lot since its earliest days in the 1500s. The breed used to be a lot taller than its squat, present-day relative, and Bulldogs earned their name as “bull-baiters.” Believe it or not, at one time Bulldogs were used to draw bulls out and hold them by the nose. This was done for practical reasons, such as to help in the castration of bulls, but it was mostly a form of entertainment. Bulldogs were successful at bull-baiting because they were able to use their powerful necks, jaws, and bodies to hold the nose of a bull to the ground. Gradually, Bulldogs were bred to be squatter and thicker to improve their effectiveness in the ring. As the centuries wore on, dog-fighting and bull-baiting was outlawed in England and replaced by dog shows. People began to select dogs for shorter legs and bigger heads, and the modern bulldog eventually emerged: a thicker, squatter version than before. Also, the aggressiveness of the original Bulldog was bred out, leaving Bulldogs, as we know them, some of the gentlest dogs around! Today, the Bulldog is the sixth most popular dog breed in the United States. 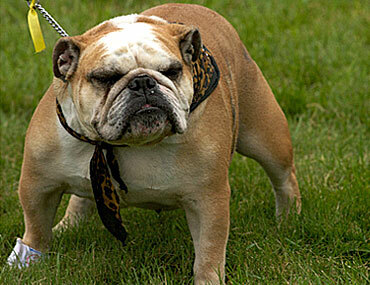 The Bulldog might look fearsome, but there’s hardly a friendlier dog around! Bulldogs are very laid-back, easygoing dogs who love the companionship of people. They do great around children as well as other pets, including cats. Bulldogs are said to “hold their beauty,” meaning they look great as puppies and as seniors. Bulldogs love going for a ride in the car, usually with their big heads out the window and their tongues hanging out in the breeze. They can be perfect dogs for an apartment or urban setting, too. They don’t need a ton of exercise – a 15-minute walk around the block will have a Bulldog ready for a snooze – and they really love to laze about. When they’re not stretched out in a sunbeam, snoring away, Bulldogs can be found loyally following their favorite humans around. Bulldogs have a very hard time with heat, but they do a lot better in the cold (within reason). In fact, if you live somewhere really warm, it’s important to have air-conditioning. A Bulldog left out in the hot summer sun can get heatstroke and die within 30 minutes. That means that it’s important to give a Bulldog exercise in the morning or evening, when it’s cooler out. Bulldogs are expensive! Because they have some health problems, it’s important to find a Bulldog bred for good health. This can run you $2000-3000. Be wary of bulldog puppies costing a few hundred bucks – you might get what you pay for in terms of health and longevity. Grooming. Bulldogs require regular grooming, but this has less to do with their short coat and more to do with the wrinkles and folds of their face. Without daily care, they can develop skin conditions and diseases. Bulldogs are hard to train – in fact, they’re one of the least trainable breeds available. It’s not because they’re dumb, it’s just because they’re thinkers and don’t automatically respond to commands. They can be just plain stubborn. They are tenacious – if not well trained and socialized, a bulldog that decides to bite or be aggressive is formidable. They have incredibly strong jaws. Ensuring that your bulldog is trained in a way that brings out his or her natural sweetness is important. Overall, Bulldogs can make great pets for the right pet parent!